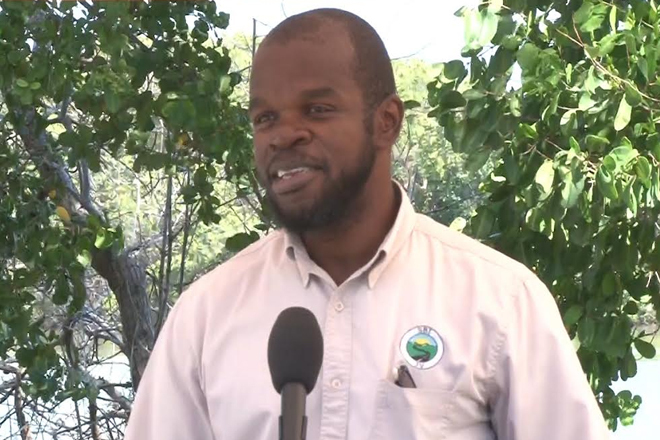 (ZIZ News) — During the ceremony that officially launched The Revitalization of the Frigate Bay Strip Project on Monday, Contract Manager of Surrey Paving, Michael Morrison said he was quite pleased to be a part of the strip transformation process. “On behalf of the contractor I would just like to say that we are happy to be a part of this project. It is small but significant in the development of Tourism on the islands of St. Kitts Nevis”, he expressed. Morrison also explained that the safety and health of persons in the area is most important as construction takes place. “As a contractor we are committed to health and safety and environmentalism. To that end, we will be implementing a number of measures to counter these effects. We will have proper dust control in place, we will have personnel on site to chauffer persons through the worksite because this is an active area and we do recognize that. We want to cooperate with the businesses. We hope for their full cooperation so that we can execute this as quickly as possible”, Morrison added. Phase one of the Revitalization of the Frigate Bay Strip includes the paving of roads and sidewalks, installation of bathroom facilities, enhanced safety and security features, better lighting and additional parking spaces. Completion is expected by December 15.